Many solar systems are designed to track, or follow, the sun’s movement across the sky. Tracking devices are categorized by the number of axes (either single-axis or dual-axis) that turn. Both types can follow the daily east-west motion of the sun, but only dual-axis trackers can track the seasonal north-south variations. Compared to single-axis trackers, the initial cost of dual-axis trackers is higher, and they require more space to avoid being shaded by other panels. For concentrating type collectors, the answer is nearly always yes because concentrating collectors need high temperatures to be efficient; they obtain most power from direct radiation, and they are ineffective if they are not pointed toward the sun. Certain concentrating collectors use heliostats, which are devices that use mirrors that are mounted so that they reflect the sunlight to a target (such as a tower collector) designed to collect the energy. Heliostats do not point directly to the sun, but they do require tracking devices to keep them moving to the proper orientation, and each one must move independently in order to keep the sun on the target. Because light reflects from mirrors such that the angle of incidence is equal to the angle of reflection, the heliostat is moved in a manner to cause the sun’s angle (measured from the normal) and the target angle to be the same. See Figure 1. Tracking systems add to the cost of any system because the tracking hardware requires a control system and a means to move the collectors or mirrors (typically with a dc or stepper motor). In general, they require stiffer structural supports than fixed arrays require. A typical flat-panel tracking collector is mounted on a pole that requires a mechanically strong structural support so that it can move into a given wind load. Tracking mounts tend to be like sails: They need to be capable of withstanding wind loads and heavy snowfall to avoid damage. Long-term maintenance costs need to be analyzed as part of the total life-cycle cost because moving components generally require periodic maintenance. Figure 1 Heliostat Measurement. Heliostats are positioned to keep the angle of incidence equal to the angle of reflection. The angles are measured with respect to the normal, which is perpendicular to the surface. Roof-mounted flat-panel PV systems are very common because they can be mounted in a mechanically stable arrangement. They are not usually designed to track because of the added cost of a roof-mounted tracking system, appearance considerations on buildings, and the added complexity and maintenance cost of tracking systems. Maintenance of a roof-mounted system is more difficult than a ground-mounted system and may add expense if the roof itself needs repairing or replacing. In the case of flat panels, the loss in energy with no tracking is primarily in the early morning and late afternoon when the sun’s rays are not perpendicular to the panel. This can reduce the total energy collected by 25% to 40%, depending on the site. By tracking in one axis, most of the energy can be collected, even if the sun is not shining directly on the collector. 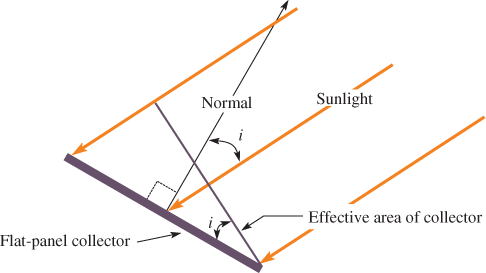 With single-axis tracking, the effective area of the collector is equal to the cosine of the angle formed between the normal line and the angle of incidence, i, of the sun’s rays. (The normal line is a line that is perpendicular to the surface.) Figure 2 shows the geometry. For example, if the incident rays are 20° lower than optimum, the incident radiation is reduced only by 6% due to the tilt angle. Many panels are configured so that seasonal adjustments to the tilt angle can be accomplished. Changing this angle at least four times per year can increase the total energy from the panel and can help with other considerations such as reducing a snow load. For tracking PV modules, another consideration is the additional space required to allow for the movement of the panels and to prevent shading. Both single- and dual-axis trackers require extra space to avoid shadowing effects from one panel to the next, so space may not be utilized as effectively as with fixed panels. For example, available space on a roof may be at a premium, and tracking could take away from the total collector area. A shaded panel also negates the benefit of tracking. Dual-axis trackers need even more space than single-axis trackers because of the larger range of motion. Figure 3 illustrates the problem with shading when more than one panel is part of a system. Figure 3 Shading on One Panel Cast by Another. The shadow cast by one panel on another can create problems as the panel’s move, particularly when the sun is low in the sky. 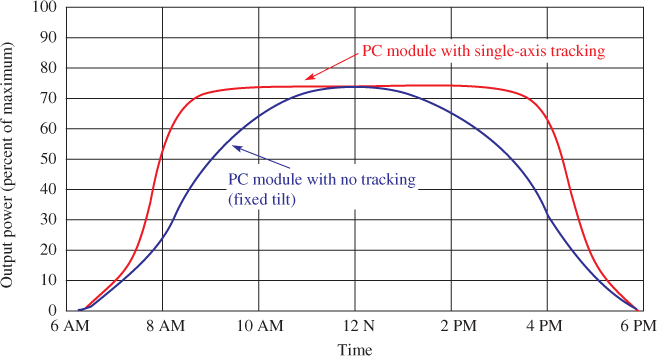 Flat-plate collectors collect more power during the course of a day using tracking compared to an optimum fixed installation. The specific benefit depends on the location and efficiency of the panels and varies with the time of year, the weather, and the type of tracking device. Some locations require more or less site work than others to install trackers. Flat locations that are also unobstructed can be less costly for building purposes than hillsides. More efficient panels are more cost-effective for tracking because an efficient panel can produce more power than a less-efficient one, so the number of panels (and tracking devices) may be reduced. Seasonal variations affect the total energy provided by the panel and have an effect on efficiency. The total power is related to the area under the curve. You can see that tracking has the greatest impact in the morning and evening hours. Also, notice that the 70% of maximum power is available for about 2 hours with a fixed module, but the maximum power extends to over 6 hours with single-axis tracking in this case. On a sunny winter day, the tracking advantage is typically 20% greater power. During the summer, the area under the tracking curve is typically 40% greater than that of the fixed array curve. Why is it necessary for a group of heliostats to move independently? Cite examples of two expenses, other than the initial hardware cost, that are incurred using a tracking system compared to a non-tracking system. Why are most roof-mounted PV systems fixed? What is the advantage of an efficient fixed panel in a tracking system over a less-efficient panel? At what times of the day does a tracker provide the most benefit? Each heliostat in a group has a different angle between the sun and the target, and the angle changes throughout the day. (1) Tracking systems require maintenance, so the location (rooftop, hillside, etc.) of the system needs to be considered. (2) They require more space than a non-tracked system to ensure one collector does not cast a shadow on another. This may affect land cost or limit the size of the collector array. A roof mount is much less expensive for a PV system because the array is out of the way and generally can be installed easily to be angled toward the sun. Using a tracking system negates this advantage; it adds maintenance cost and may make the building unsightly. When space is at a premium, the combination of a more efficient panel and tracking can be cost-effective because it can increase the total energy collected.